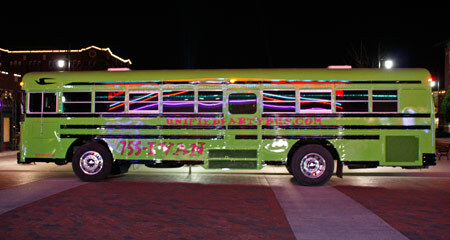 After being in business for 8 years we are not the only Party Bus provider in Kansas any longer. You may or may not have realized that until now but you do have other options. We used to list the other companies that were currently operating as well as a link to their websites however most of them requested to have their name removed from our list. We believe after doing your research you will agree Unified Party Bus is the best service around and the only company operating completely legally to insure your safety and our reputation stays intact. Unified Party Bus is currently the only local short haul charter company legal to operate anywhere in the state of Kansas. Kansas requires a DOT number to operate and a DOT number does many things but the major one is to ensure the company has commercial FOR HIRE insurance. A DOT number is very inexpensive, however insurance is very expensive. It is very cheap to get RV insurance on a bus and is completely legal to operate with that insurance. However it is highly illegal to operate for profit with that type of insurance and in the unfortunate event of an accident the passengers are NOT covered. If a company does not have a DOTKS number on each side of their buses they are not legal and most likely do not have the proper insurance. It is also required to have KCC authority if operating further than 3 miles from where the buses are kept. This sounds silly however it is the State Law. Keep in mind I am talking about local short haul carriers not the great over the road charter bus companies we have locally in Kansas. We are the only company to have KCC. This is tough to get and requires a tremendous amount of time keeping up with the requirements which include drug and alcohol testing for all drivers, background investigations, driver logs, bus inspections, maintenance records and quite expensive fees. If the Kansas Highway Patrol stops a bus without KCC authority it is not as easy as the driver getting a ticket and going on, the bus is typically put out of service and the passengers have to find an alternative way to get back home.